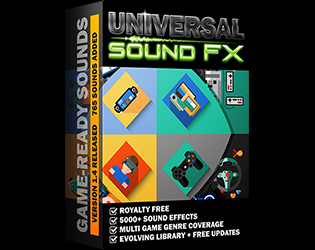 Universal Sound FX (USFX) provides game developers with a wide variety of high quality sounds at a very affordable price. Independent game developers often have a low or non-existing budget; USFX was designed with indie developers in mind. USFX has thousands of appropriately named and categorized sound effects providing a great foundation when developing games. From the very start you will have sounds regardless of what genre of game you are making from puzzle games to first person shooters. High Quality! Current version (1.4) contains 5000 categorized 16 bit 44.1kHz WAV files (stereo and mono depending on suitability). Sounds are game-ready mastered and have been optimized in length to reduce size of game distributions. The sounds are free of clipping, always start/end at volume 0 to avoid any clicks or pops, and looping sounds are seamless. The wav-files are meta-data tagged with descriptive keywords. USFX evolves over time as I record and design more sounds. Updates are provided free of charge to existing customers, but keep in mind that some sounds will be removed to give room to new sounds so make sure to keep older versions of USFX backed up.